SAL DeTRAGLIA'S VIRTUAL TAPAS BAR: WHO YOU CALLIN’ "EL GORDO?" WHO YOU CALLIN’ "EL GORDO?" Spain’s annual Christmas Lottery is probably the biggest event of the holiday season. Make no mistake—this is no normal lottery. It is, in fact, the world’s biggest gambling competition; and the sums involved are enormous. 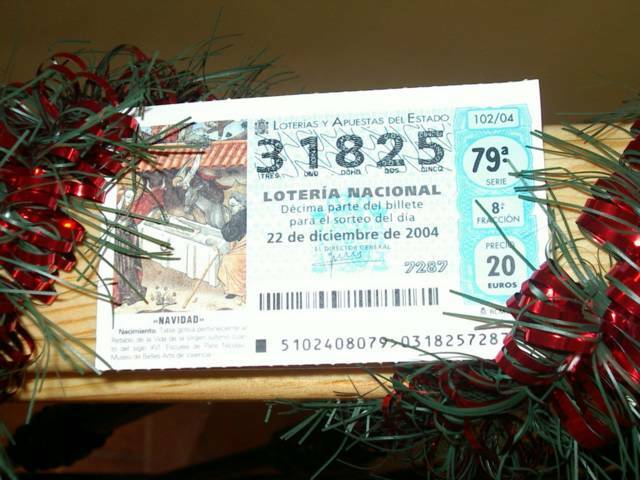 In 2002, the Christmas Lottery paid out 1.6 billion euros in prize money. Little wonder, then, that up to seventy-five percent of the Spanish population plays it. But the Christmas Lottery process can be as confusing as a Buñuel movie, so let me provide a quick primer. Lottery tickets come in two varieties: décimos and participaciones. Décimos are a full ticket, and cost 20€ each. Participaciones are fractions of a décimo, and can be bought for as little as 1€. Of course, a winning décimo’s pay-out is similarly discounted. With tickets in hand, all of Spain waits for the ceremony to take place a few days before Christmas. The ceremony is a rather formal affair that is broadcast on TV and radio. On stage are two giant, spinning, gold cages. Each cage is filled with numbered balls. The cage on the left determines the winning ticket numbers; the cage on the right determines the amount of prize money. A pair of orphans from Madrid’s San Ildefonso Orphanage bound onto the stage. The cages are spun under the watchful eye of an auditor, and balls drop out of each. The orphan tending the cage to the left grabs his balls (heh heh…sorry ‘bout that) and chants the winning five-digit number (“Treinta y dos - ochenta y uno - cinco”). The orphan at the cage on the right then chants the amount of prize money payable to that winning number (“Un mil E-uuuuur-oooooos”). These chants, I should mention, will continue echoing through your head for days after the Lottery has ended. If you thought that ABBA songs were sticky on the brain, then you’ll probably find the after-effects of Spain’s Christmas Lottery downright torturous. Anyway…the scenario described above repeats itself hundreds of times during the next three hours of the ceremony. As such, there is not a single winning number as in “normal” lotteries, but rather hundreds of winning numbers. Most of the winning tickets pay out small to moderate sums. But not all do! First prize—the BIG prize—in this competition is known as El Gordo (“The Fat One”). This is the reason that so many people play the Christmas Lottery. El Gordo can pop up at any time during the ceremony—it all depends on when that naughty cage on the right decides to cough-up the magic ball. In 2002, there were 180 people whose tickets matched the El Gordo number—and each of these tickets paid-out nearly 2 million euros. Not bad for a 20€ investment, eh? When the El Gordo number is announced, TV crews rush to the place (usually a bar or Lotto shop) where the stack of winning tickets were sold; by which time, the winning ticket holders have already broken out bottles of cava (i.e., Spanish “champagne”) and are well on their way to getting drunk before millions of envious eyes. LIKE A VENDING MACHINE WITHOUT ELECTRICITY. MY SALTY EXPERIENCE WITH PEPPER MILLS.